We get a lot of awe-inspiring sunsets here in California, especially along the coast in the fall and winter for some reason. One of our favorite sunset spots is at the beach in Carlsbad. If you get there on a day where the ocean fog hasn't rolled in early, the last hour of sunlight makes for spectacular viewing. 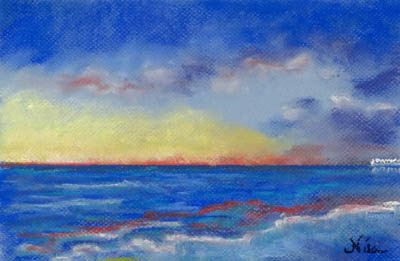 I used blue-toned Canson Mi-Teintes paper for these two sunset pieces, one showing the view north (including the distant lights of the Oceanside pier) and one looking straight out over the horizon. I took the reference photos back in December, on a day where we decided to avoid the Christmas shopping rush and hide out down along the beach for a few hours. It's summer again, and time for another Sojie Workshop. This time the focus is on landscape and light, with guest demos and a variety of translations including traditional and digital media. I wasn't sure if I would participate this round, as being pregnant makes it difficult for me to predict how I'll feel each day. 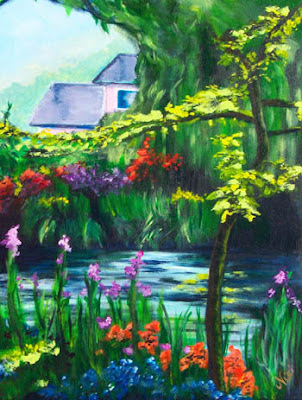 Scrolling through the photo gallery, though, I spotted one that called to me: a photo of Monet's garden in Giverny. I was lucky enough to be able to translate this photo, and the result is above. Haven't touched the pastels lately, but I bought a new set since I was running out of colors and have been yearning to put them to paper. A few years ago, I took some great photos at Irvine Park. I'd been to the park a few years in a row without even knowing there was quite a bit of water there, rife with paddle boats for the amusement of park visitors. I snapped this scene from the train, knowing one day it would give me a great little painting exercise. 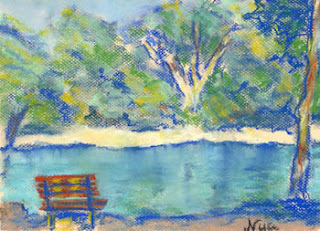 Something about the park reminds me of the images from the old Impressionist works, with families enjoying picnics or lounging on the water for the afternoon. I didn't see any ladies in nice dresses with parasols, but the atmosphere is quite similar-- a nice place to relax on a summer afternoon.